Bulls and bears can agree that today was one of the stranger days of trading in recent history. There were no less than four intra-day reversals, but I lost count. While the market fell on weaker than expected economic numbers, stocks most sensitive to the economy fared the best. The bulls will argue that there was a lot of put buying today for a market that closed down slightly. We had a healthy retest of Friday's lows and we are simply digesting Monday's gains. The bears will argue that the market is beginning to show a change of character. In addition, the economic recovery looks like it is losing momentum and is purely stimulus based. I stand with the bears but am confused shorter term. Have a good night. I hate conspiracy theories because they are simply not actionable and don't help anyone make money. However, I can't help but think that there has been some tape painting going on as we head into the all important end of quarter. The market exploded Monday, a day when there was low volume because of the holiday. If one wanted to get the maximum bang for his buck that was the perfect day to paint the tape. Add to that the mysterious bid that entered the market this morning as we started cratering lower. Wheres my tin foil hat? The market will not be maximum oversold until Tuesday of next week. Market corrections at this time of year have a reputation for being brutal. How far percentage wise this correction could go is a completely different question? I am not a chartist and my reasons for owning the sector have nothing to do with the chart but I am certainly not upset to see it. The sector is shunned by retail investors. Mom and pops bought pharma a decade ago when stocks like Pfizer traded at 40 times earnings and were priced like growth stocks. Their losses are so great on the stocks that they don't even want to hear about the sector. The sector is shunned by portfolio managers, as everyone wants to be in stocks that will benefit from a cyclical recovery. Stocks such as Pfizer and Eli Lilly trade at 8 times earnings and have bond like dividends. There is a near term catalyst to get the sector moving. Pfizer is acquiring Wyeth and Merck is acquiring Schering Plough. The two deals have a combined cash component of over $50 billion. That means more than 5% of the stock in the sector will disappear in the next few weeks. If the sector gets moving everyone who is underweight will need to buy it in order to keep up with their benchmarks. A growth slowdown would just be a bonus. IBM has been able to grow earnings because of its services division. This has largely offset a plunge in hardware revenues. Recently, Hewlett Packard has acquired EDS, Dell bought Perot Systems and Xerox bought ACS. With everyone looking to get in on the services game, will increased competition kill the golden goose? The market held support, right where it should have. In the past few months when the market bounced off support, a new high was not that far off. We are approaching quarter end, which tends to be positive. Employment Friday is approaching, which has tended to be a market positive day recently. And I will add the closing of Pfizer/Wyeth should be a positive for the overall market as the deal has a $40+ billion cash component. The problem I have with this argument is that other than the last point, it seems even the bears are citing these arguments for a short term rally. That doesn't mean it won't happen, but the bulls would be better off if the crowd was more skeptical. For clarification, I remain short the SPY even though I have a large pharma position. I am now fully loaded on pharma names. I have bought Eli Lilly and Schering Plough. This is in addition to my outsized Wyeth position. I believe the closing of the Wyeth/Pfizer deal will act as a catalyst for the sector. Chinese authorities have approved Pfizer and Wyeth's merger. Wyeth is by far my largest holding. The deal could close as easly as next week as finall approvals are expected in the coming days. There is a $4o billion+ cash component to this deal. The closing should give the market a boost, especially the healthcare sector. The most common explanation I found for yesterday's rally was the return of Merger Monday. This explanation makes little sense as Abbot Labs bought a division of a European company and Xerox's takeover was predominantly in stock. As an aside, most of the cash takeovers this year have been in the healthcare sector, where companies never stopped generating solid free cash flow. Meanwhile, investors shun the sector and use healthcare takeovers as excuse to buy other sectors. More likely, the buying was a result of investors knowing the drill. A few down days and off to new highs. This likely led to inflows over the weekend and buying throughout the day as not to be left behind. I mentioned on Friday that the pullback was approximately the same size of previous pullbacks during this record shattering rally. I would caution that once everyone knows the drill it is generally late in the game. ofcourse that does not preclude one last rally. The buyers stepped up right at support. Given how well the dip buyers have done recently, it is not a surprise to see them giving it a shot at the first real support level. It is now the bears turn to defend their territory. We are entering the area when one can start thinking about a bounce. However, the timing is off. Late in the day ahead of a long weekend. Little sign of fear. Its a tough call. Research In Motion seems to be getting a large beating for what seems like a small miss. When few are short and everyone is long, this is a reminder of what can happen if the sellers suddenly arrive. What would happen if sellers suddenly showed up in the broader market? It felt to me like a l lot of people were getting bearish before the open today. As such, it was very surprising for me to see heavy call buying during the first hour of trading. The dollar has turned much weaker against the Yen and somewhat weaker against the Euro. It seems the dollar and the market are going their separate ways with the market now down. Breadth is tilted in favor of the bears, but not by much. The home sales numbers released in the past two days reflect contracts signed two months ago. My contacts tell me contract signings really picked up in late August and September as people tried to beat the deadline for the tax credit. We should see a spike in sales in the coming months. That it will be one time is a different story. The market has turned south after some economic data that came out worse than expected. Monday is a Jewish holiday and many traders will not be around. I doubt many will want to step up before a long weekend, so it is an imperative for the bulls to turn the market around early in the day if they are going to do so. The later we get in the day with the market down, the less likely a turnaround will be. Good Morning. The most interesting part of yesterday's decline was the number of high quality stocks that actually traded up on the day. Microsoft, Procter & Gamble and Wal Mart were all higher while the more speculative stocks were down more than the major averages. I believe we are seeing a sea change. Since the March low the low quality companies have outperformed the high quality companies. Regardless of market direction, I no longer believe this will be the case. The market is attempting a bounce this morning. The two mini pullbacks that we had during the recent rally lasted 40 to 45 points on the S&P 500, from the intra-day highs. The high after the Fed meeting was 1080, which would equate to 1035-1040. The bulls should attempt a bounce from those levels if we get there. How successful that bounce will be is a separate debate. Research In Motion is down $10 after reporting their earnings results. This is leading to an after hours selloff in other momentum names. A few quarters ago when Research In Motion missed earnings, I used the same title for my article. I received thousands of hits from search engines. I take it they were looking for something else. Julian Robertson says what seems so obvious, yet few seem to understand. Some stocks in the drug sector have turned positive. Eli Lily, Johnson & Johnson and Wyeth are all trading slightly positive even with the market down hard. Portfolio managers have abandoned the sector as everyone is playing the recovery trade. However, these stocks are much cheaper, even if a recovery takes hold. Most drug stocks trade at single digit price to earnings ratios, while cyclicals trade close to twenty times "projected" earnings. Those projected earnings are based on a recovery, which may or may not occur. In the next few weeks Pfizer's acquisition of Wyeth and Merck's acquisition of Schering Plough should close. The two deals have a combined $50 billion cash component. A lot of money in the sector will be looking for a new home, which should give a boost to the sector. We are seeing put buying coming into the market. In the past few months whenever the put buyers stepped in the market has had trouble making much downside progress. Existing home sales show that sales were punk even with the government giving out money to first time home buyers. Most of the people who are receiving the tax credits would have bought the houses anyway. Economists estimate that we are spending $40,000 for each incremental house purchase that the tax credit is generating. This is a waste of money and is keeping the housing market inflated. The cure for low prices is low prices. Money should be spent on initiatives that will create jobs rather than artificial steroid shots. Turning natural gas into a fuel for cars would allow us to lower our energy dependence, lower our deficit and create domestic jobs. However, politicians don't care about the future, they care about being reelected. I believe the new home buyers tax credit will turn out to be as big a disaster as Cash for Clunkers when all is said and done. The dollar, stock markets and commodities have all been moving in lock step. Oil has broken ranks and has fallen below important support. The market is giving the downside a try. The market blew through Monday's low. The first level of support should be 1050. I have heard that number thrown around a lot. Tonight should be another night of heavy stock issuance. I believe the market will have a rough time making much progress between now and the weekend. Good Morning. The item that stood out most about yesterday's trading was that we hit an air pocket late in the day and the market just cratered. That was different from any of the declines we have seen in the past few months. There are precious few short sellers to cushion a decline "if" sellers emerge. The market is gapping up after an improvement in new jobless claims. I would be surprised if the bulls were aggressive today after yesterday's drop. I believe we will see the bears try the downside again before the weekend. Today's FOMC statement couldn't be worse news for the US Dollar. The Fed is continuing with its loose monetary policy and money printing. Despite that the dollar managed to rally. Combined with the Commitment of Traders report showing record US Dollar shorts, it would make me stop and think if I were short the US Dollar. Indeed, the dip buyers used up their ammo a little too early today. There will be a lot of IPOs and secondaries again tonight. After a nasty reversal like this I would expect the bears to at least try the downside again at some point tomorrow. Have a good night. The Fed paid lip service to a stronger economy but changed nothing. Talk is cheap and the market is reacting in kind. The dip buying is becoming more aggressive. The S&P 500 was down a meager 4 points and the call buyers quickly jumped into action with the ISE Equity ratio shooting over 200. In most market environments one would expect to see increased put buying as the market goes down. Is it possible that the dip buyers are becoming too aggressive and not leaving enough ammo in case we get a real break? This market has been a short seller's nightmare. Mobile device maker PALM had 30% of its shares shorted. Short sellers realized that PALM was burning through its cash pile and correctly assessed that the new PRE would do little to stop the cash burn. But PALM was able to raise over $300 million in a secondary offering last night that was over subscribed. They are still a company that is burning through their cash but they now have more money to burn through and investors are sending the shares higher. The shorts had the proper analysis but in this market ignorance is bliss. Last night, airlines AMR and US Airways were also able to raise more cash through stock offerings, allowing them to lose money for a little while longer. Good Morning. Today is Fed day. Interest rates are at 0% and the government is printing money so it is a near certainty that monetary policy can only get tighter. It is hard to believe that any good news can come out of the Fed meeting for the bulls. However, the way this market has been operating the news does not matter. The market just goes up every day and thus far today looks no different. Over the next 3 nights there are over $9 billion in IPOs and secondary offerings on the calendar from a total of 29 companies. I understand readers frustration with my bearishness. I feel like the guy in Times Square with the sign. However, these frenzies always feel like they will never end and they always do. Have a good night. Yesterday, the FDIC said they might borrow money from the large banks to cover their shortfall. Mr. Practical on Minyanville points out that the FDIC, which is supposed to be the insurer, is borrowing money from the insured. If Bernie Madoff had that type of setup, he could have persisted forever. Citigroup's stock is trading higher on news that Singapore's sovereign wealth fund has cut its stake (They received their shares on September 10, the same day the US government received theirs). That means they have been the big seller in the market recently, as the stock was more than 20% off its highs. The stock is higher because this means they are done selling. Singapore selling less than $5 billion worth of Citigroup took the stock down 20%. What will happen when the US government tries to sell their $30 billion stake? The way this market works, that's tomorrows problem. The market is gapping up strongly this morning. With the market so overbought and sentiment so stretched, it would be very surprising to me if the market could build on these gains. Good Morning. A lot of readers wanted to know more about why I capitulated yesterday and covered the bulk of my short position. Stated simply, I couldn't allow myself to lose that much more money on a single trade. It was a very tough decision, especially because I believe the trade will ultimately be profitable. The market continues to trade like its 1999 and I believe the end result will be the same. The biggest mistake investors make is to think that because a condition has persisted, that means it will never end. When in reality the more stretched this market gets the sharper I believe the snap back will ultimately be. I covered the all in portion of my short roughly where I put it on. In addition, I cut my core position in half. I still remain somewhat short but against pharma longs. My opinion of the market has not changed. However, I already turned a great year into a good year. This is where I draw the line. I will be back bright and early. Have a good night. Market breadth has been horrific all day, even when the market was trading flat. This is likely related to the flight to higher quality stocks. There is quite a bit of supply on the calendar. There are over $7 billion of new offerings scheduled for this week. The offerings generally occur later in the week. Every Friday, The Commitment of Traders report is released, which shows open futures positions. Speculators have record bets against the US dollar. The last time we saw this level of bets against the dollar marked the low for the dollar. In addition, there were record longs in Gold, which is sometimes an anti dollar play as well. This morning we are seeing broad US dollar strength. Good Morning. The argument that the government is printing money so everything must go up is appealing to both those who are bullish on the economy and bearish. It even allows those who believe we are headed down an unhealthy path to buy stocks. As if the price action were not enough, this rally has a seductive story as well. While the government has certainly greased the wheels, I believe this rally is a result of the investment community going to record cash and subsequently scrambling to take risk again. However, once the scramble is over stocks will need to stand on their own two feet, which is valuation. Dividends are low and valuations are high, except when compared with the period of the twin bubbles we just emerged from. The economy is unhealthy and dependent on government assistance. The quantitative easing programs are running out and will likely not be renewed unless the economy relapses. In the long run I have little doubt as to how this ends. The rally off the March lows has been record breaking. Never before has the S&P 500 rallied 60% in 6 months. The recent run from the July low alone has been greater than 22%. The closest thing I have ever seen to the current trading environment was the tech bubble (not in terms of valuation but in how the market moves). With that caveat, the market is extremely overbought and we are at extremes that have at least led to pullbacks, even in this recent rally. Expiration is firmly in control of the market. One item of interest today is that higher quality stocks seem to be outperforming. This is notable because this is the first time we have seen this in a very long time. Higher quality name like Pfizer, Wal Mart, Procter & Gamble and ExxonMobil have not kept up with the market as everyone is chasing risk. Just maybe this is an inflection point. To all who observe, Have a Happy New Year. Have a great weekend. Everything I have learned in trading has come from losing money. The rally of the past 10 trading days has taken my account from an all time high to a not insignificant drawdown. During the past few days I have been doing some soul searching to figure out what I did wrong and what I can learn from this. My trading style is to wait for markets or stocks to go to extremes and take the other side of the trade. Over the years this style has worked best for me and I have no plans to change it. Since we have stocks going to extremes not seen in decades, it was pretty much a given that I was going to get caught on the wrong side of this trade. That does not mean that I have not done anything wrong and that lessons could not be learned. Lesson 1- Powerful capitulations are usually followed by powerful rallies. The March bottom was one of the most powerful capitulations in history. In that context this rally is not as surprising. I have learned this lesson before and thought I was being very careful but it appears I was not careful enough. Lesson 2- Selling covered puts or covered calls is not the same thing as getting out of a position. After the 4.5% pullback 2 weeks ago my account was at a record high. I was still bearish in the intermediate term but was neutral to bullish short term. I covered a small amount of my shorts but mostly wrote covered puts against my positions. The 1% in premium I picked up was nothing compared to the 7% rally in the market the past 2 weeks. Selling those puts was a band aid on a bullet wound. I should have taken down my positions. Lesson 3- Sit on the sidelines when in doubt. This goes back to two weeks ago, when the market pulled back and I was ambivalent in the short term. My positions were pretty big for someone who was ambivalent. I was exhausted from fighting the market and sitting it out would have been the best course of action. Lesson 4 - Never underestimate the retail investors propensity to follow the herd. Much of my short thesis was based on data that money managers and hedge funds were at low to normal cash levels. I knew retail investors were sitting on a lot of cash but thought they would be more hesitant because of last year's debacle. This past week we learned that volume at retail brokers went through the roof this Summer and Fall. Retail investor's are once again chasing the market. I am certain there are more lessons and I welcome readers to give their thoughts. Good Morning. Even during this six month rally, which has been the most powerful of my lifetime, there have been pullbacks. A lot of the factors that have led to previous pullbacks are now in place once again. The 10 Day moving average of the Advance Decline will be maximum overbought by the end of the day today. While Rydex traders backed off their short positions a week ago, it was only yesterday that they reentered aggressive long positions. Wednesday saw very emotional buying and call buying has been extreme. Today is option expiration and we often get a down day after expiration. Apologies for the lack of posts but its hard to provide any insight. News does not matter, nor do fundamentals. The market will keep going until the buyers exhaust themselves. Today's action could be summarized as no shorts to squeeze but not many sellers either. Have a good night. Good Morning. This morning's opener will be short. I can only repeat so many times how unprecedented the current rally is. The character of the market changed yesterday. We finally saw some unbridled optimism and sloppy buying. Just maybe that will lead to some sort of pullback. Nothing matters but tech has been leading this rally and Oracle just missed on revenue. After a 60% run from the lows the market is just not stopping despite my protestations. I believe we are in the midst of a blowoff. Until this point investors were waiting for dips. Every dip has become smaller and smaller and investors are now on the chase. This will likely not end until everyone who wants to get in is in and the next dip should be a big one. Have a good night. I am all in short. Walking away from the screen for the rest of the day. If there has been another day where there has been more call buying I certainly can't remember it. Methinks the buyers are starting to get sloppy. After calling the government stress tests "asinine", an FT article is reporting the CEO of Wells Fargo is calling on the government to buy jumbo loans via Fannie Mae and Freddie Mac. Socialism when its good for him, capitalism when its not. This man has no shame. Wells Fargo & Co., the nation’s biggest home lender, expects overdue loans to increase as the bank continues to digest its takeover of Wachovia Corp. The bank prefers to hold its nonperforming loans rather than sell them because the costs of liquidation “remain challenging,” according to a presentation by John Stumpf, chief executive officer of the San Francisco-based lender, at an investor conference today in New York. ...The bank wasn’t accruing interest on $15.8 billion of loans as of June 30, or 1.9 percent of the total, the bank said in today’s presentation. That’s $5.3 billion more than the previous quarter, the bank said. If only I could write up the value of my horrendous short trade of the past few weeks to what I think its worth. Put a multiple on my normalized earnings and sell shares to investors. Last night I saw Apple up $2 in after hours with the futures pretty flat. I looked everywhere but couldn't find any news. I finally went to the Yahoo message boards and figured out that Jim Cramer put a $246 price target on the stock during Mad Money. This is a Yahoo message board/ Mad Money market. Funny thing is the stock is now up $3. At the beginning of the year no price was too low because the news was "bad". Now, no price is too high because the news is "good". An article in today's Wall Street Journal was titled "Return Of Day Traders Drive Rise In Volume". Are they going to bring back the eTrade commercials from 1999 with the kid out of college showing his boss what's what? It appears gold is breaking out this morning. While I am fascinated by watching it trade, I don't have a strong opinion on where it will go as I don't trade commodities. What amazes me is that the smartest people I know are so split on this inflation vs. deflation debate and hence on gold. Good Morning. One item that is clear to me is that there are precious few shorts to squeeze, so any further gains will need to be through fresh buying. Throughout the rally of the past few months every time the market would break out to a new high we would suddenly get a burst higher as all the shorts ran for cover. However, in the past few days every time the market has made a new high it has not been followed by a burst higher. This is also backed up by looking at short interest numbers, which are the lowest since February 2007. Rydex data shows little shorting and anecdotally nobody wants to be short. At the same time the buyers are not getting over exuberant and chasing the market higher. Instead, they wait for pullbacks and are buying shares on dips. That leaves the market grinding higher. The buyers become more aggressive and start chasing stock. If that occurs I believe it would be a last hurrah as the market is already so stretched and will be maximum overbought in the next few days. Yesterday, the favorite stocks of retail investors had a nasty day (C, BAC, AIG, FNM, FRE). Retail investors provided the fuel for the latest move up in the market. If their positions start showing them losses its possible that they will pull back, so keep an eye on how those stocks trade today. If Citigroup does their offering sooner rather than later, I believe the rally will be over. Firstly, the enormous size of any offering will be difficult to absorb now that virtually everyone is already long. Secondly, this has been the stock that has pulled retail investors back into the market. If they begin to lose money in earnest on this trade they will likely turn away from the market. 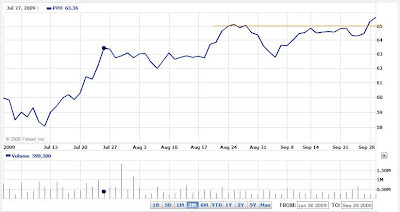 "Trading in active exchange-traded-funds and low-cost financials were up 39% and 139%, respectively, in August, with five individual stocks -- Citigroup Inc., Bank of America Corp., American International Group Inc., Fannie Mae and Freddie Mac accounting for up to 30% of NYSE exchange traded volume," wrote JMP Securities analyst Michael Hecht in a note to clients. The US Dollar is once again falling out of bed and commodities are shooting higher leading to yet another leg up in the markets. The never ending rally continues. Looks like this rally wants to end with a bang. Have a good night. I know a lot of individual investors are attracted to Citigroup because of the low dollar price. However, I would like to remind readers that the market cap is close to $100 billion because of all the new shares. A $30 billion share sale by the government would be the largest share sale of all time. There is no reason to step in front of that. Now that the government's intention to sell Citigroup has leaked, I believe the longer the government waits to sell, the lower the price they will get. According to the news stories the sale will take place in October. The biggest risk to the bulls in the short run is that the timetable gets moved up because of the leaked story. Once again the dip was bought and the lesson has been reinforced. We are once again seeing heavy call buying. I know, it doesn't matter. I added to my short position after the higher open. I believe there is a higher than average chance of a reversal today if we get an emotional open. I know my call for a lower market has been horrendous. But my trading feel has been pretty good as I have been adding to my shorts at the right time and covering my shorts at the right time. Unfortunately, I have been carrying a core short position that has just killed me. Good Morning. After the market was able to brush off yesterday's trade war with China, it seems that the remaining skeptics joined the camp that the market will never go down again. In the past day I heard phrases like "This market can't be shorted" and " There is nothing that could take it down". Which makes me wonder, who is left to buy? There are already $4 billion worth of offerings on the calendar for this week and an equal amount for next week. In addition, it now seems that the government wants to sell its $35 billion Citigroup stake and Citigroup wants to raise capital on top of that. There has never been a time other than the past few months when companies have issued shares at such a feverish pace and the market has continued to rise. I believe the reason was that historic risk aversion took people into large cash positions that were subsequently deployed into these offerings. However, now that the consensus is that the market can only go up, it is likely that the bulk of cash has been deployed and these huge offering will not be as easy for the market to absorb. It is well chronicled that humans have a recency bias. We tend to put a lot more weight on what has occurred recently and don't factor in the bulk of history. On every time frame the market has been going up, whether it be one week, one month, three months or six months. We are hard wired to believe that the market can never go down again. However, looking at the broader picture from a valuation, sentiment or supply/demand picture everything is pointing to a lower market. According to Bloomberg the Treasury is considering selling their $35 billion Citigroup position. They couldn't take it down so they are taking it up. I have seen enough. Have a good night. Every week the FDIC takes over failed banks and every week the assets on the banks balance sheets are written down by 30% overnight. Does this not make eager buyers of bank stocks wonder how assets on bank's balance sheets are being valued? After all the failed banks are following the same GAAP accounting principles that the surviving banks are following. There is little doubt that banks are carrying assets at far higher values than the market would pay for them. The hope is that banks earn their way out of the losses. Currently the banks borrow from the government for free and turn around and lend the money back to the the government via Fannie Mae, Freddie Mac and Ginnie Mae. Realized losses might force banks to accelerate write downs. The yield curve will not stay this steep forever. That is a guarantee. Inflation picks up making the game of borrowing short and lending long a lot less profitable. FDIC assessments are currently being treated as one time charges even though they are likely to go on for many years to come. New financial regulation that reduces leverage will lower profit margins. What is the business model of banks? Home loans are dominated by the government, which used to be where banks predominantly lent. It is hard for me to believe the level of call buying that I am seeing on the heels of this China news. The level of complacency is astonishing. The move this weekend with China emphasizes how unthought out US economic policy has been. On the one hand the government is trying to reinflate a debt bubble without dealing with any of the structural imbalances in the economy. On the other hand they are biting the hand that allows them to have a debt bubble. What exactly is the strategy? As I wrote in my opener the knee jerk reaction is to buy the dip. In the first half hour we are actually seeing call buying on the China news. Bank of America and Citigroup are seeing continued weakness. The real test will be after the first hour. The 56% rise of the S&P 500 off the March bottom is the largest rally since the 1930's. At the lows the market did not even reach levels of valuation of lesser bear markets than the Great Depression. The stock market has not responded to extremes in sentiment, extreme overbought readings or negative employment news. The current extremes are unlike anything I have ever seen. Jim Cramer looks like an outright genius. The widespread explanation for the rally is liquidity, which is somewhat of an ambiguous term. At the lows money managers and investors were holding more cash than at any other point in the past few decades. I believe the rush to deploy that cash once the market started up is the reason for the rally. At some point under invested money managers and investors will be fully invested or even overweight. When that happens stocks will need to stand on their own two feet. At current valuation levels it is hard to see that happening. Dividends are meager compared to stock prices. Companies are not returning cash to shareholders through buybacks, but rather issuing new shares.What will support stock prices once the rush is over? Good Morning. News of a trade war between the US and China is dragging the futures lower. While the impact of the tariffs imposed will be small, there are fears that a larger trade war could be brewing. Tariffs and protectionism automatically cause people to think about the Great Depression. This could also cause people to focus more on the Obama administration's policies, such as raising taxes that will not be economically friendly. I believe that starting a trade war with ones largest creditor while running a one trillion dollar deficit is barely comprehensible. There seems to be little long term thinking in any decisions that are made. Although that has not stopped the stock market from partying like its 1999 thus far. If the stock market is looking for an excuse to roll over this could certainly be it. The action underneath the surface on Friday was worse than the slight losses that the scoreboard reflected. Financial stocks have been lagging the past few days and market leader Goldman Sachs had an ugly close after gapping up $3 in the morning. I suspect the dip buyers will give it a shot at some point today. Here is a picture of me from last week. It was more painful than it looks. The bulls have made it a clean sweep for the week. After a 57% run from the March lows the market is still running with a full head of steam and I'm caught standing on the tracks. Have a great weekend. Doug Kass on RealMoney.com is reporting that he is hearing rumors of a GE secondary. Yesterday, I wrote a column where I said I suspected a secondary was on the way because of all the recent analyst upgrades on GE and the expiring FDIC loan guarantee program. If this is true I don't believe it will be taken well by the market. Goldman and Apple are the two most important stocks in the market. If they go below their earlier lows the market could have a nasty close. The biggest mystery to me is why treasuries and gold are soaring at the same time? If gold is going up because of currency debasement shouldn't treasuries be going down? I am going out on a limb and saying today will be a down day. We are seeing extreme call buying. At the same time market leaders Apple, Google and Bank of America are all lower. Good Morning. Last night John Mack stepped down from his role as CEO of Morgan Stanley. Unlike Goldman Sachs, Morgan Stanley has not benefited as much from the recent melt up in markets as they decided to reduce their risk. For his caution John Mack is being shown the door. It is as if the entire crisis never happened. CEOs are being fired for not being aggressive enough and investors are running back to the market again with disregard for value. After chasing hot Internet stocks and hot real estate, investors are on the chase once again. While speculation in markets will never die, generally after bubbles burst risk appetites remain low for long periods of time. The saying once burned, twice shy does not seem to apply to market players these days. While I have little doubt as to how this will end, knowing the timing is the trick in the market. Knowing the ending is easy. If the market does not turn shortly, I will be forced to watch from the sidelines. The bulls have manged to close the market at new highs. There is little for the bears to lean on and the bulls are eager buyers of every dip. My experience is that the hardest trades are often the most rewarding and there is little doubt as to what the hardest trade is right now. However, the key is to stay in the game. As such, I am giving myself a little more breathing room before I cut bait. Have a good night. Truth be told, I am nearing my uncle point. While I believe that this will not end well, I can only allow myself to lose so much in a trade. I have set a mental stop loss. I was not able to sleep last night as life as a bear has not been easy recently. While watching infomercials I realized that we were likely to test new highs today. We were so close to the highs that the bulls had nothing to lose trying to run the stops. The moment of truth is here. The bull case for the remainder of the day is that breadth is two to one positive while Goldman Sachs is hitting a new high. The burden of proof is clearly on the bears. The bears will say that Texas Instruments inability to rally on good news says a lot. In addition, Apple has turned red and Bank of America has been down all day. One lesson I have learned before that is being reinforced is that the bigger the capitulation, the longer extreme sentiment can persist. We had a massive capitulation in March and that is the reason we have been able to rally despite the extreme sentiment. 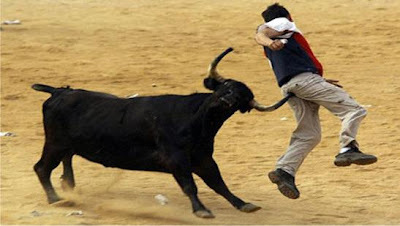 That said, I have rarely seen a time when the bulls were so complacent and fearless. Defensive stocks are finally starting to show some life with Procter & Gamble leading the way. Its hard to find anything negative to say about this market, but in March it was hard to find anything positive. GE is the largest user of the FDIC's loan guarantee program. They issue debt backed by the FDIC that carries a low interest rate. However, when the program expires on October 31 their cost of capital will rise. They are one on the most heavily levered companies and hold a vast array of toxic assets from all parts of the World. The prudent thing to do would be to do a capital raise to lower leverage and hence lower their borrowing costs. Could that be the reason GE is suddenly getting upgraded everywhere? Are bankers sniffing out a large secondary and want a piece of the action? If GE has to come to the capital markets at a later date when they need the money, it will be at a much dearer price. They should bite the bullet now and raise equity. Commodities reversed lower, Apple reversed lower but the stock market managed to close up strongly. Secondaries, seasonality nor anything else seems to be able to put a lid on this market. I remain bearish and believe this is as good as it gets. Have a good night. Last week, when the market was lower I sold covered puts against my short positions. I am buying them back now for pennies on the dollar. With that I am a little shorter. The most flabbergasting part of this rally is where the gains are coming from. Investors continue to shun cheap defensive stocks in favor of cyclical stocks. Last night, we had announcements of $7.5 billion in new stock offerings, almost entirely in cyclical stocks. At the same time we are seeing large cash buyouts in defensive sectors. If there were going to be another leg to the rally I would have thought it would be the cheap stocks catching up to the expensive ones. Logic simply does not work in this market. For now. I thought the market had some upside because those returning from vacation were likely to go long, but I did not think we would see this. The most universally held belief is that this market can't go down/ Don't fight the tape. Even those bearish on the economy are buying stocks. That is precisely the reason I believe the market has large downside potential. We are finally seeing some exuberance today, with heavy call buying. Call buying has been absent since the market bottomed last week. I remain short and wrong. Barrick Gold is the largest gold mining company in the world. Yesterday, they announced they will sell up to $3.5 billion in new shares in order to buy back their gold hedges. Barrick sold their gold production forward at lower prices, in order to lock in what they thought were high prices at the time. They say that the reason they are buying their hedges back is because the outlook for gold is good. Could Barrick have been the reason for the recent run up in gold prices? Could they have been the ones recently buying? Or did someone in the market sniff them out and buy ahead of them? I was not very happy with their explanation for buying back their gold hedges. After all, their timing was horrible in selling gold forward. What makes them think that they suddenly know how to predict the price of gold? Good Morning. I believe that the upside is capped for the next few weeks and that there is the potential for a large shakeout. I was expecting a busy secondary offering calendar as investors return from Summer vacation, but the flood of offerings that hit the tape yesterday surprised me. This is likely just the beginning. In addition, the IPO calendar is beginning to grow and that will only add to the supply. Two months ago a flood of stock issuance hit the tape from financial firms, and while there was a hiccup in June but ultimately the market managed to move ahead. I believe that the reason that the issuance had a relatively small effect was that money managers were at record cash levels and they used the offerings to get back to normal levels. Currently, cash levels are on the low to normal side at money managers and I don't believe this market can handle a flood of offerings. Historically, heavy stock issuance has been a large negative for markets despite the fact that we escaped relatively unscathed two months ago. Ignore the warning signs at your own risk. The writing is on the wall. I hope the bulls saved up some money. Recently all the movement has been at the beginning and end of the day, with the market just meandering most of the day. That was supposed to change after everyone came back from vacation but here we are after Labor Day with the same pattern and the volume has not returned either. Supposedly, an article in the Telegraph today, with a Chinese official complaining about US money printing is the reason for the fall in the US Dollar and rise in Gold. Traders returning from vacation are likely looking to get long. That could keep a bid in the market, but I believe most of that buying was already done. Once they are buckled in I expect the market to head lower. It looks like the hot money is leaving the lottery ticket financial stocks and going into the commodity stocks. Love em and leave em. That's why they call it hot money. Healthy rotation or follow the financials? I can't imagine a scenario where a sustained move higher in gold is a good thing but obviously the market doesn't agree with me. Yes, I'm tempted to buy gold. But I have to stick to what I know and I know little about commodities. The liquidity that the government has unleashed is starting to go to all the wrong places. Oil and gold are going through the roof while the dollar is hitting new lows. It looks like the government is now firmly in between the proverbial rock and hard spot. Stop the liquidity and the economy crashes, keep it going and we get inflation on top of joblessness. Time to pay the piper. I am slowly adding to my short positions. Good Morning. We are now firmly entering the period of negative seasonality that September is famous for. The bankers are returning from vacation getting ready to make some commissions with a slew of IPOs and secondary offerings. The market does not seem to care about seasonality, supply of new stock or that the economy is still shedding jobs. Momentum rules the day as making money has never been easier. I always liked to do things the hard way and will be looking to increase my short positions in the days ahead. From looking at the recent 13F filings and strategist recommendations, it is clear that just about everyone is recommending and/or overweight cyclical stocks that will benefit from an economic recovery. The 10 strategists polled in Barrons favored cyclical stock sectors. When asked what sectors to avoid 6 out of 10 said to avoid healthcare and consumer staples. This is likely because investors chase performance. Since this rally began low quality stocks have greatly outperformed higher quality stocks. However, when this rally began everyone was shunning more risky stocks, while now the opposite is true. From a valuation standpoint the sectors that people are avoiding trade at much lower valuations than the sectors everyone is piling into. Healthcare and staples trade at low teen multiples to actual earnings. While cyclical sectors trade at high teen multiples to expected/normalized/fantasy earnings. In addition, we are seeing cash buyouts in the healthcare and staples fields, while cyclical companies have been raising equity. There are some large deals closing in the near future including Pfizer/Wyeth and Merck/Schering Plough. These deal closings could serve to give the more defensive sectors a jump start. Sometimes the crowd is right but in my experience when everyone is betting on the same outcome it is usually not a great bet. Despite the fact that a rip roaring recovery is already priced in and the Jobs Numbers leave much to be desired, it seems squeezing the weak shorts is too much fun to resist. I am calling it a day before I get tempted to reload on my short positions. While I suspect I will eventually reload on the short side, I want to see how things look next week before doing so. Have a great weekend. There have been a dearth of secondaries in the past few weeks as Wall Street went on vacation. I expect that as everyone returns to work next week there will be a slew of secondaries. Up until now secondaries have not caused much of a hiccup as under invested managers used them to gain exposure. However, with cash levels low they might start to have a negative effect. The private equity re-IPOs will be starting in the next few weeks as they recycle back the over leveraged companies they bought a few years back. The US Government and sovereign wealth funds will receive their shares in Citigroup on September 10. Their combined stake is worth nearly $50 billion. It is unclear if and when they will sell but its worth keeping an eye on. Yesterday, we saw a move out of defensive stocks into more aggressive sectors. Staples and healthcare were down while more cyclical sectors were up. I suspect we will see a reversal of that trade today. Even if the market does manage to rally I would expect it to be led by the Procter & Gambles of the World. Good Morning. Last month everyone went gaga over the Jobs Report. Job losses were revised higher by 49,000 and the unemployment rate reversed last months decline and then some. The market is actually lower than where it closed after last month's Jobs Report. It sure doesn't feel like the market has been down for the past month. It is hard to argue with a straight face that today's employment figures were good. But that is not stopping the bulls from trying to run the market higher. I am expecting a pretty quiet day as people duck out early for the long weekend. I plan to do little. The oversold rally finally showed up. I am going to stick my neck out and say that the Jobs Report will disappoint tomorrow. The $64,000 question is will the bears be able to capitalize on it? The real action will start after Labor Day. I remain of the belief that we are headed lower in the next month but the short term is too close to call. Have a good night. Due to the fact that weekly unemployment claims have stayed high, it seems that the risk of the Jobs Report is that more jobs will be lost than expected and unemployment will be higher. However, given recent disappointments in weekly claims and the ADP report a lot of that may be priced in. I covered a few shorts this morning and added to my pharma longs. I remain net short to a decent degree but the fact that we have come down so far so fast no longer warrants as aggressive of a short position as I have been carrying. I reserve aggressive positions for times when both the shorter and longer term are lining up. Right now the shorter term outlook is mixed. It seems fear is creeping back in the market. We had some scary moments this morning and the put/call ratio at the CBOE is starting to climb. AAPL, GS, BAC and C are all strong. It looks to me like the market is going to try and put on a rally. I am being told that the reason pharma is down today is because same store sales at drug stores were weak. If people can't even pay for their meds than a lot of other sectors are in a lot more trouble and trade at much higher valuations. I remain very bullish on pharma in relation to the rest of the market. This Congressman from California's stupidity is astonishing and scary. I have bought more Wyeth. Last night, Sepracor (a small pharmaceutical company) was bought by a Japanese company for over $2 billion. The amount of cash deals happening in the drug space is amazing. I'm going with the private buyers and added to my Wyeth position. Good Morning. Last night I was assessing my positions, as I do every night. The S&P 500 had gone in a pretty straight line from 1040 to 995 with support approaching at 980 and sentiment is becoming more supportive of a bounce. A bounce from here could lead to 1020-1025 on the S&P 500 before we head lower. I used the decline of the past few days to cover up a decent amount of short exposure, but decided that the short term outlook probably merited covering up a little more and putting them out again on a rally. Unfortunately, the S&P futures are up 6 points and that changes the risk/reward of covering shorts here. I still believe we are headed lower through the remainder of September, possibly much lower. However, I believe the odds of a bounce have increased in the shorter term. As such, I covered some more shorts in the pre-market. I remain net short and will look to increase my positions if a bounce does arrive. Fed President Lockhart is saying that the Fed is discussing the possibility of leaning against bubbles. Did it really take them this long to figure it out? Everyone is talking about riding this bubble and going with the flow. In the housing bubble and tech bubble the vast majority of those who participated were true believers. Can we get a bubble if everyone believes its one? Did everyone except me leave for vacation? Are we working off the oversold reading or just shaking everybody out before a move higher? Will we have to wait until after Labor Day to figure out where this market wants to go? While I believe we are in a corrective mode, the market seems edgeless to me in the shorter run. The best things bulls have going for them is that we are quite oversold in the uber short term. Investors are back buying calls which decreases the odds of a solid bounce. Breadth is quite negative even though the market is flattish. Oil and the dollar are both flat as oil sits at its lows from 2 weeks ago. A further break in oil is likely to trigger another leg down in the market. A lot is being made about the fact that Wells Fargo CEO John Stumpf said he will pay back TARP without raising equity. Despite Wells Fargo's huge exposure to California and commercial real estate, Wells Fargo is apparently generating accounting profits so quickly that the funds will be generated internally. Prudential recently exercised a put option to sell the part of Wachovia Securities it owns to Wells Fargo for $5 billion and Wells has until December 31 to pay up. Wells Fargo has the option to pay in stock. It is extremely likely that Wells will pay Prudential in stock, especially if they don't raise equity. Wells is among the most leveraged banks out there and they would be making a mockery of regulators if they paid back TARP, only to become vastly under capitalized shortly thereafter by paying Prudential in cash. So while they might not be raising equity, I believe they will be issuing equity. Good Morning. The S&P 500 is down about 40 points from its highs on Friday. That is roughly equal to the pullback it experienced two weeks ago. A bounce here would not be surprising but there is no reason to believe that a bounce is imminent. Put buying increased but not by much considering the magnitude of the decline and Rydex traders pulled back but are still positioned pretty aggressively. The market has been going up for seven weeks, which is a very long time in rally time. The market needs a couple of weeks to correct and wring out the excesses. Levels of complacency are high and we are headed into the seasonally weakest part of the year. I believe the decline has the potential to surprise many in its magnitude as the most universally held belief is that the downside is limited. To summarize, I would not be surprised if the market bounced from here as we have come far since Friday and we are sitting on a minor support level. A bounce from here is likely an opportunity to add to short positions or sell as I don't believe it can go very far. However, the 980 and 950 areas on the S&P 500 should act as stronger support if one wants to play a short term bounce, especially if we get their quickly. It looks like I gave the economy too much credit. Auto sales for the Big Three disappointed. GM and Chrysler had negative year over year sales. Money well spent. According to Calculated Risk home sales would also have disappointed without the first time buyer incentive. The US dollar is finally back in synch with the markets and is rallying strongly. Time is the most important aspect of a correction and this one just started. I would wait until option expiration before even considering getting long for anything more than a quick trade. The S&P 500 is down 25 points from where I doubled down on option expiration. Even though I believe this correction is far from over I took some profits on my short positions. That's just discipline. I'm headed out early. Have a good night. I am long Pfizer via Wyeth once again. This is against a pretty heavy short book. As the market goes lower I plan to expand my pharma longs but I am going to go very slowly. This correction needs time. I have sold 95 SPY Puts against my remaining SPY position that is unhedged. At 95 I would cover anyway. Economic indicators have been and will continue to get better. There are three reasons for this and all are temporary. Cash for clunkers increased car sales and many industries will benefit from the production of new vehicles. However, this is a one time event and since the deal ended demand for automobiles has dropped even lower thane before clunkers. First time home buyers are being given $8,000 by the government to buy a house and they must close by the end of November to qualify. This is giving a huge boost to home sales but I expect demand to implode once the deal is over. People were frozen while the market was cratering between September and March. Many people held off on buying stuff they needed. Since then we have benefited from that pent up demand. However, I believe that the pent up demand is in the process of being used up. The US government is approaching structural issues in the same way that Michael Jackson's doctor does, by upping the drugs. However, this will not lead to a self sustaining recovery or a healthy patient. Maybe we were able to put on a concert/rally but that's about it. Addittionaly, I believe the market has already priced in a recovery and then some. I am very short even though I expect economic numbers to continue to come in "better than expected". Rydex traders responded to yesterday's drop by increasing their long positions. It seems everyone has learned to buy the dip. The put call ratios were neutral yesterday but there certainly was no rush to buy puts. The best thing the bulls have going for them is that its the first of the month and they still have the momentum. Goldman Sachs has always been good at making money for Goldman Sachs. However, their equity research always seems to be on the wrong side of the market. Goldman was recommending buying at the top of the tech bubble and the top of the real estate bubble. More recently, they were adding American Express and Dell to their conviction sell list at the market lows. Goldman gets the benefit of the doubt because they always seem to earn money. However, that has little to do with following their own advice. Paul Tudor Jones, the billionaire hedge-fund manager who outperformed peers last year, is wagering that Goldman Sachs Group Inc. and Morgan Stanley got it wrong in declaring the start of an economic recovery.